During the 81st edition of the Bol d’Or (15-17 September), Honda welcomed over 100 Fireblade riders from across Europe, who attended the inaugural Fireblade festival, which is set to become an annual event. Guests were treated to a full weekend of activities at Circuit Paul Ricard, which culminated with the Honda Endurance Racing team finishing the 24-hour race on the podium in third place. 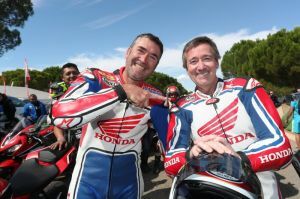 Honda Ambassador Jean-Michel Bayle hosted the Fireblade guests over the weekend, as well as three-time World Champion ‘Fast’ Freddie Spencer, who led the guests on a parade lap of the famous circuit and also guided the Fireblade Festival goers through the 24-hour weekend. As well as getting to ride the circuit, guests were treated to a behind-the-scenes look at a 24-hour race, along with a dedicated campsite and star Q&A’s with Bayle, Spencer and the two Honda endurance teams; Honda Endurance Racing and F.C.C TSR Honda France. You can view the Fireblade Festival video on YouTube or Facebook, for all the latest news on the Honda Endurance Racing team follow @HondaRacingCBR on Twitter.